We’re delighted to announce a new partnership with WisdenAuction.com, a website set up to connect and service collectors of the Wisden Cricketers’ Almanack. 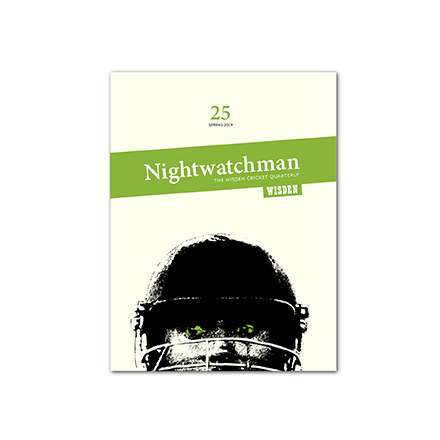 Starting in March 2017, extracts from The Nightwatchman will be published on WisdenAuction.com newsletters. Now eight years old, WisdenAuction.com, has for the first time the ability to offer fellow Wisden collectors every year of Wisden, includng the rare editions and all of the hardbacks. The site has its origins in 2005 when owner Chris Ridler was sold some rather over priced Wisdens. As a result he decided to set up an information site, www.wisdens.org, so fellow collectors could see the true price of each book. Since 2006, every known book over £30 has been record and listed, and in the same year the site added a forum where people could chat about cricket and Wisdens: www.wisden.club. 11 years on it’s still going strong and boasts 28,000 posts and close to 1,000 members. With the popularity of these two sites increasing, Chris started receiving emails such as “Do you have book x for sale?” and “I have book x for sale”. To better service these requests, he created an online catalogue, and in 2008 www.wisden.auction was born allowing buyers and sellers to trade Wisdens. More than three million hits and 8,000 sales later, it is going strong with the added factor that many of the sellers on the site that own stores have access to the super rare Wisdens meaning for the first time every Wisden year is available. As for the man himself, Chris has a complete set of Wisdens, and just one cover away from every original page. He is happy to help any collector on their journey to help take the edge off his own collecting bug!